Need an automotive repair shop that you can trust plus afford Romeoville? We offer Romeoville domestic & foreign vehicle repair service A-Z. 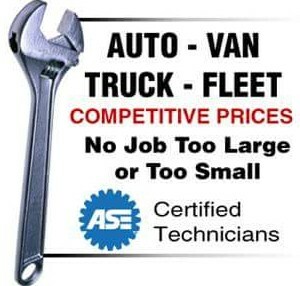 Services include auto repair, oil changes, brakes, transmissions, and a whole lot more. 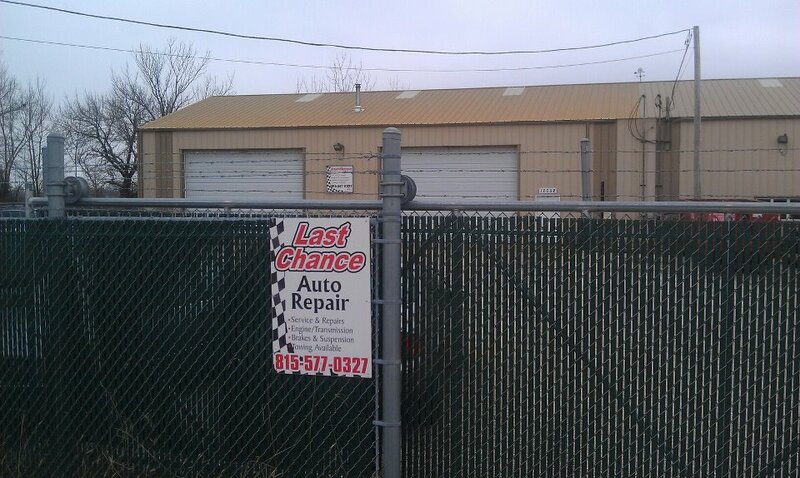 Last Chance Auto Repair is a full-service preventive maintenance and automotive repair center. We perform high quality, guaranteed service you can trust at a fair price, we even offer a local competitor low cost guarantee. Last Chance Auto Repair offers Romeoville auto repair & service at it’s finest. Every auto repair shop claims to be the best. We just are simply the best. Top notch, highly trained mechanics, we work on just about everything. BBB A+ quality you can trust. Family owned with family prices included. Hence we even offer a low cost guarantee. Call us 24-7! 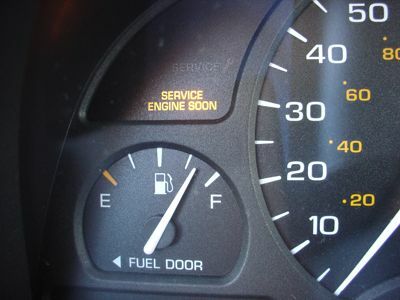 Want to learn more about Romeoville auto repair service at Last Chance Auto Repair? Wondering what makes our team your #1 choice for all your Romeoville auto repair service needs? Need an auto repair or service Romeoville? Call our team now, later, 24-7! Question: How long has Last Chance Auto Repair been serving Romeoville, IL? Answer: Our business has been serving Romeoville Land since 1978. Answer: Our auto repair shop hence team at Last Chance specializes on domestic & foreign, repair & service, a-z. Including engine, transmission, timing belt, maintenance, suspension and brake repairs, services, diagnostics just to name a few. We offer quality auto repair & service priced right, (we are family owned) we even have a low-cost guarantee and an A+ rating with the Better Business Bureau. Click here to check out more about our BBB A+ auto repair shop. Question: How did your father and you first become interested in the auto industry? What is your backgrounds? How did Last Chance Auto Repair come to be? Answer: Last Chance Auto Repair is a father, son & family team. Ron ran a Hendrickson Trucks research lab. Worked as a Dodge Trucks service manager. Grew up racing on the streets of Chicago. Corry a Universal Technical Institute graduate. Trained in domestic & foreign auto, diesel, electrical, technology. Including Mercedes Benz, BMW, GM, Ford, Daimler-Chrysler, vehicles a-z. A Tellabs electronic tech. Arrow Trucks A.S.E. trained mechanic. Started out of the family garage. Since were nice, we like helping people, our love for the auto industry, business just took off. Question: How do you differentiate your auto repair shop from other auto repair shops in and around your local Romeoville, Naperville, Plainfield, Bolingbrook, IL, area? Answer: We are family owned and ran. We accept & beat most local estimates, quotes, and prices from all of our local competitors by 10% if not more. We were established in 1978, our team has over 100+ years of total auto business, knowledge, know how, plus repairs & services under our belts. We stride in having top notch, certified, highly trained mechanics. We all have many years of hard work, training, customizing, auto services, plus schooling to bring to the game. The team, auto repair shop, Last Chance Auto Repair, is always here for you. Did you have some more questions that need to be answered about our Romeoville auto repair shop? Don’t worry the questions and answers continue. Maybe you have some other questions that weren’t covered here? Worry no more our team is always here for you. Call now we’re currently giving away free answers to all questions. Get auto repair Romeoville at it’s finest by putting your vehicle in the good hands over at the one and only team Last Chance Auto Repair. 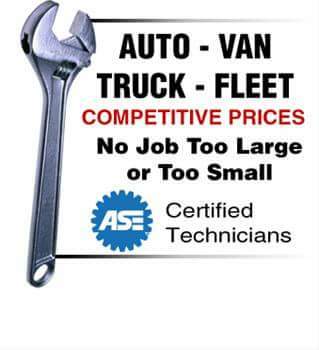 We’re here for all your car, van, SUV, truck, classic vehicle repair service needs. Call our team now, later, 24-7, to schedule an appointment. Question: How many locations do you have and do you have plans to expand? Answer: One main location that is located at (12052 S Naper-Plainfield Rd) but there are three other shops (businesses) that were partnered with. Question: Provide detailed directions to your auto repair shop. Answer: Were inbetween 119th street & 127th street off of Naperville Plainfield Road. Were actually about a mile away from Romeoville. Were on the border of Naperville, Bolingbrook, and Plainfield, IL. Aurora is just a couple miles away. Were next door to E.F. Heil’s strictly clean landfill & concrete drop off, the Naperville Polo Club, Bolingbrook Golf Club and directly across the street from Plainfield East High School . Find us over at 12052 S Naper-Plainfield Rd. Question: What type of payments do you accept over at Last Chance Auto Repair? Answer: We accept Visa, MasterCard, Discover, debit cards, check, cash, trade. We even have a repair & service financing (payment) plan that can be used on most of our auto repair services that our automotive repair shop offers. Question: What Chicago South West suburb area’s do you offer your auto repair & service? Answer: Romeoville is a given but also Plainfield, Bolingbrook, Naperville, Aurora, & all surrounding suburbs in need and even beyond. Sometimes we even have people that come from an hour or more away. You brake it, we’ll fix it, a-z. Question: Who owns your “Romeoville” auto repair shop and or runs the daily operations? Answer: Family owned and ran. Ask for Ron, Corry and or the Team. Question: What are the hours for your automotive repair shop? 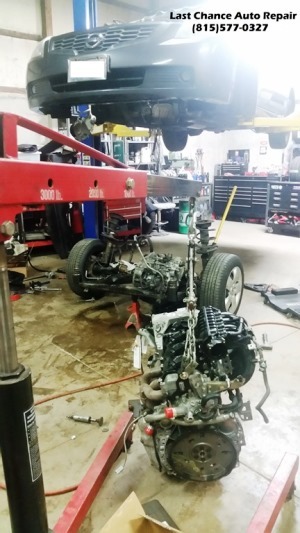 Our main goal is to be the best automotive repair service center in our Romeoville area. We pride ourselves on the affordability mixed with quality that our family owned and operated auto repair shop offers to our Romeoville customers/friends. Our rates are more then fair, were honest and very competitive. We are so confident that we even guarantee it. At our shop, unlike other shops that try to lure you in with coupons, you never need a coupon for a low cost quality service. Were here for all your domestic & foreign vehicle services a-z. So does that answer all your questions? Would you like to schedule an appointment for your next auto repair and or service? How may we help you? Our team Last Chance Auto Repair is always here for you. Give us a call today, tonight, 24-7.